As the 2018 FNB Dusi Canoe Marathon season begins to kick into gear, 2016’s Dusi silver medallist Sbonelo Khwela is hoping to kick up his preparations at the 2017 Ozzie Gladwin Canoe Marathon on Sunday, 26 November. The Ozzie Gladwin traditionally fills an important role in the preparations for many Dusi paddlers with the race providing the top athletes with an opportunity to gain front-row seeding points as well as testing the all-round skill of paddlers early in the season. The 26km ‘Ozzie’ showdown might not be a race on the uMsundusi River, however it provides similar challenges to the three-day Dusi with a paddle across the Albert Falls Dam, a portage and then 21km of river paddling to the finish at Thornville Farm. Euro Steel/Red Bull’s Khwela, who finished second in the 2015 Ozzie Gladwin with Banetse Nhkoesa, partnered Jasper Mocké for the recent Fish River Canoe Marathon where they finished ninth, a result that Khwela was happy with. “We didn’t get in a boat together until the day before the Fish,” he said with a smile. “I think that we did well considering we had never paddled together and it was fun getting back into a K2 and racing with someone new. The Ozzie Gladwin is the race that sees many of the top competitors compete against one another for the first time and with the 2018 Dusi following the K2 format the ‘Ozzie’ often gives people an indication of potential combinations. “I have been thinking about it and I have chatted to Siseko Ntondini about paddling together, so I will paddle with him if he is available for Ozzie. “He is a strong paddler and is good in the front of the boat but we haven’t even got close to discussing who is going to be driving. “The distance isn’t going to be a problem with him in Johannesburg and me in KZN, I am sure that we can work well together,” Khwela added. Khwela showed his prowess when he ran his way to second at last year’s Dusi and he sees the Ozzie Gladwin as a good opportunity to dust off the cobwebs against some other Dusi title hopefuls. “I always look forward to Ozzie because it is a good all-round test with a solid stretch on the dam followed by a portage and then some good river paddling. 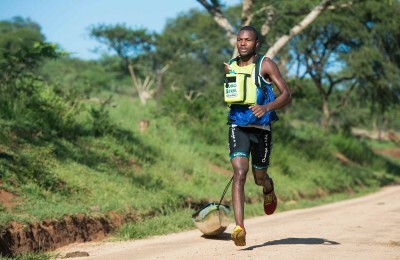 There are a number of races that Khwela plans to make part of his build-up to the Dusi in February 2018. “The Umpetha Challenge, Ozzie, 50 Miler and a few of the other smaller races all form an important part to my preparation for the Dusi. “It’s another big year for me and I am looking forward to our river season getting underway,” an excited Khwela commented.